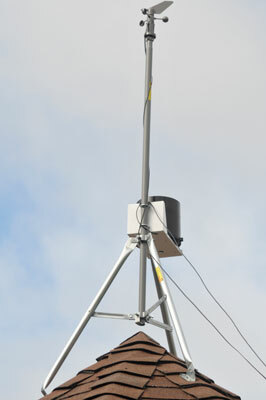 Tripods are used for many applications where you need to support something above the ground. 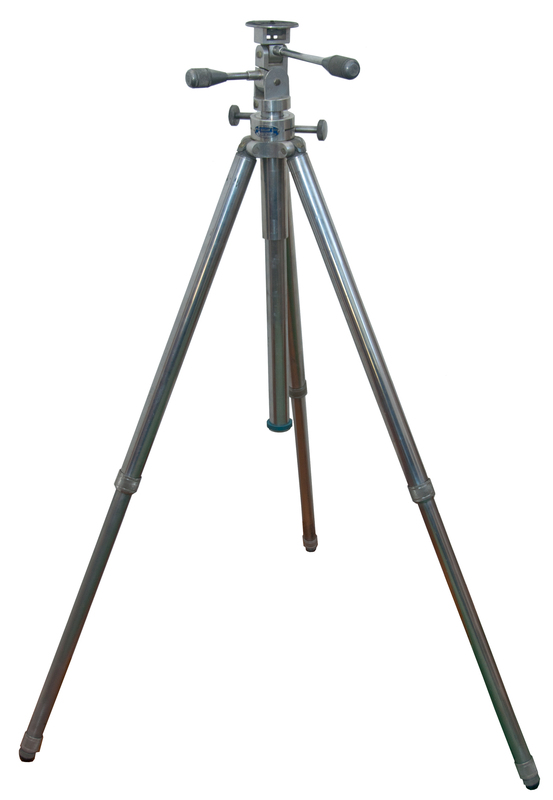 There are some similarities and difference in tripods depending on the application and where in the world they are being used. 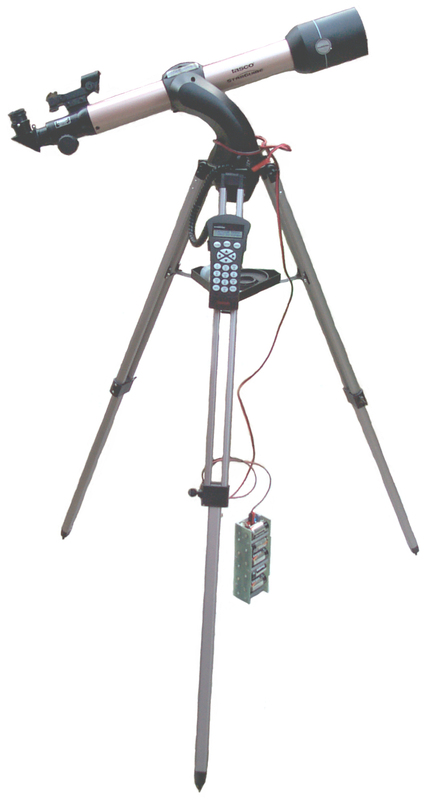 Some common applications are for use with: Astronomy, Binoculars, Cameras, GPS receive antennas like for the PLGR or DAGR or Trimble antennas and Surveying instruments. Most tripods have some design limit on how much weight they can carry. If that weight is exceeded the clamps may not work, allowing the load to move in unexpected ways (and it may allow the load to hit the ground). For example the Slik F740 can not hold the Nikon D300s and a heavy lens without tipping down, but the TiltAll or Arri tripods can hold it. Spreading of the legs is another problem as weight is added. An outdoor tripod, like the Arri and TiltAll have spikes that can be extended from the feet to dig into the ground which helps the legs from spreading. But when indoors when the spikes are retracted to protect the floor the rubber crutch tip feet may slide on a smooth floor lowering the weight capacity. 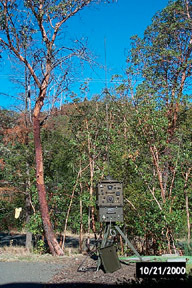 The most common tripod use is to hold something at standing eye level, like a telescope, camera to surveying transit or theodolite. There are also times when you want to hold a camera close to the ground and at the same time be able to pan, tilt or rotate it and some tripods like the TiltAll allow the central support to be installed from the bottom. Table top photography would appear to be a place for a small tripod but that doesn't work out to be the case, see Center of Mass below. So for that application a clamp with a 1/4 bolt or ball head is the way to go. There are a number of "cute" small (under one foot tall) tripods on the market, but if you place a load that has a center of mass that's outside the tips of it's legs the tripod will fall over on it's side. This happens with those small tripods with almost any practical load, even a USB camera will flip it over because of the weight of the cable. If the tripod is going to be used for movie or video where the head will be panned left or right then there are new things to consider. There needs to be a way to plumb the rotation axis (or level the head) so that when you pan the camera keeps pointing at the horizon instead of pointing into the ground or the sky. Also the panning motion needs to be smooth. The Arri tripod has a "Ball Head" that's a hemispherical surface and the moving parts have good lubrication so it pans very smoothly. An even better head is the "Fluid Pan" head that pans smoothly with heavy loads. 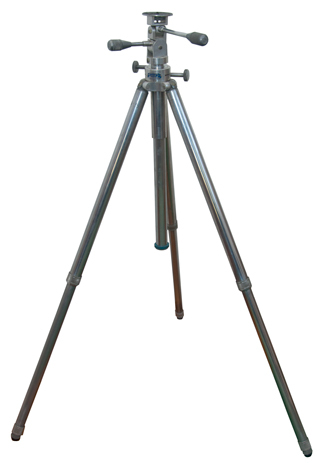 Most surveying tripods have spike points at the tip of each leg and a small shelf that you can stand on to force the tip into dirt. These legs do not work on smooth surfaces where they might allow the legs to open. 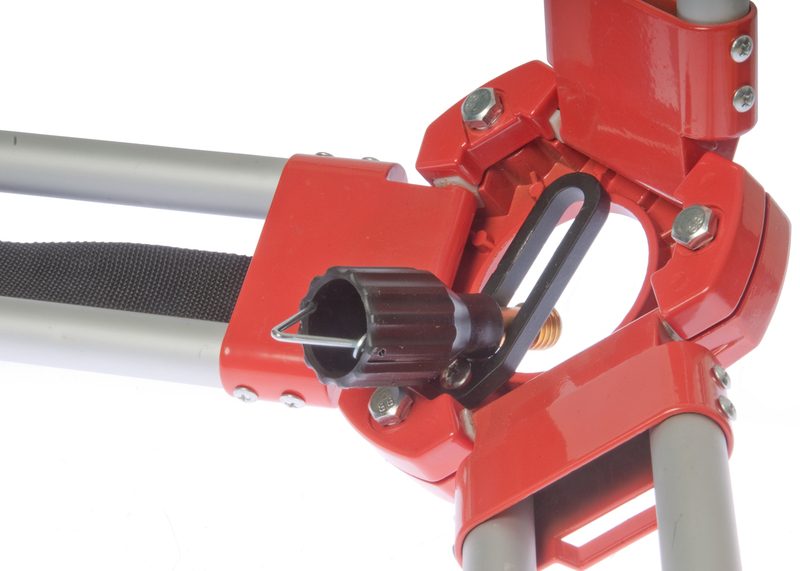 The TiltAll camera tripod has rubber hemispherical tips that work well on smooth indoor surfaces and also have points that can be screwed out when you need more traction in dirt. See my Telescope Mounts web page. Equatorial (Polar) (Wiki) where there's a plate that can be adjusted so it's plane includes the North Celestial Pole (Wiki). This type of mount allows one motor to de-spin the Earth's rotation and set the hour angle (Wiki) and at right angles to that axis an adjustment for declination (Wiki). Azimuth-Elevation (Wiki) used on lower cost telescopes. Will work with GoTo telescopes (Wiki). Dobsonian (Wiki) is a head type where the astronomer moves the telescope by pushing on it. This requires both a balance about the horizontal and vertical axis of rotation and in addition some friction on each axis so the scope will stay when the pushing stops. Many tripods are custom made for a specific application. Usually there's a good reason like to minimize weight or size. In early times standards had not yet developed so each company did their own thing. In the case of a military product making instead of using a standard tripod increased the company profits. How the head can be moved (or not) and how it attached to the item to be supported can vary a lot. In addition there are adapters to allow one tripod to be used for an additional purpose besides the one it was designed to do. The attachment method needs to match whatever you want to support. 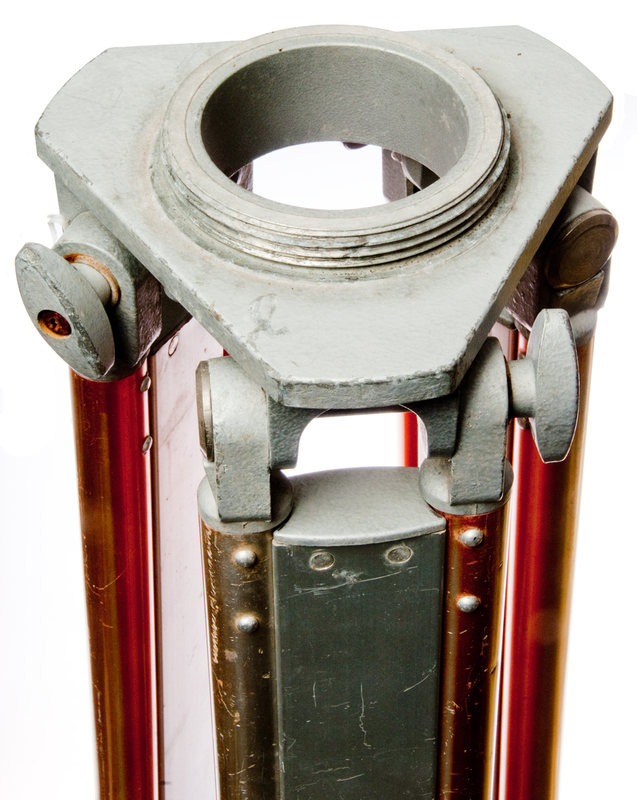 This is probably the most common attachment for tripods and is intended to hold a camera as used in the U.S. and many other countries. You would expect the European camera thread to be some metric size, but it's really a U.S. 3/8"x16. 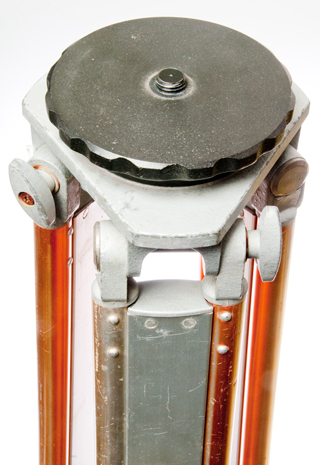 Example: the Arri Movie Camera tripod. This is a larger thread than the US 1/4" so would be better for heavier cameras. 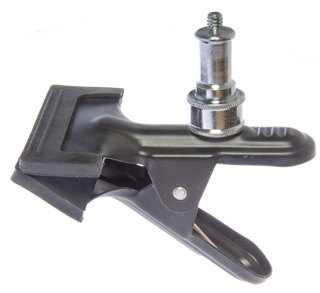 Instead of turning a screw or the device you are attaching a proprietary plate is attached to the device and then it can be quickly installed or removed from the tripod by the operation of a lever. The problem with these is that they are all different but you can get more top plates of the same kind. Example: Slik F740 camera tripod, Veibon QRA-635L Quick Release Adapter used on the Arri tripod to hold the Nikon 300mm telephoto lens. This is an older surveying tripod thread. I got an adapter from 3-1/2"x8 to 5/8x11 so that I could mount GPS antennas on a 3-1/2"x8 surveying tripod. 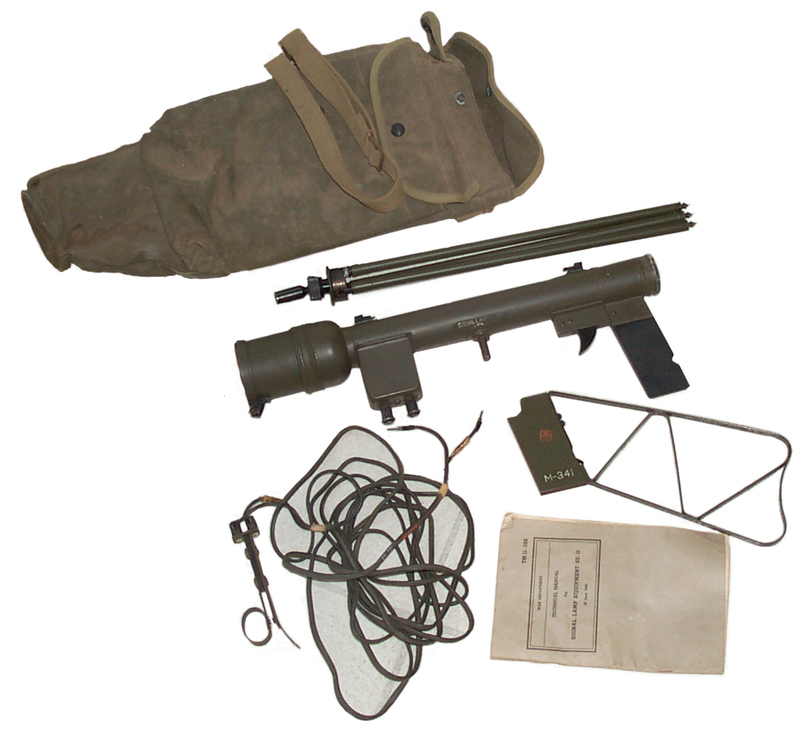 Modern surveying instruments that make use of a Tribrach (Wiki) typically includes an optical plummet instead of or in addition to a hook for a plumb bob (Wiki) require a hollow 5/8x11 male thread on the tripod. 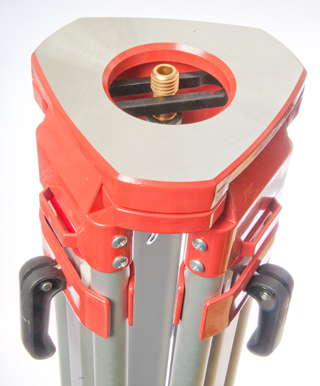 Note: A Tribrach is only needed if the surveying instrument does not already have an optical plummet built in and you don't want to use a plumb bob (Wiki). The problem with plum bobs is that wind moves them and the price goes up with the weight. "Aluminum Survey Contractor Tripod for Transit Laser"
"Northwest NAT83 Survey Aluminum Tripod"
a "V" shaped wire for hanging a plumb bob. Light stands for Photography have a spool head and the lighting equipment has a hollow sleeve and pinch clamp. See the Photography Studio Lighting web page. 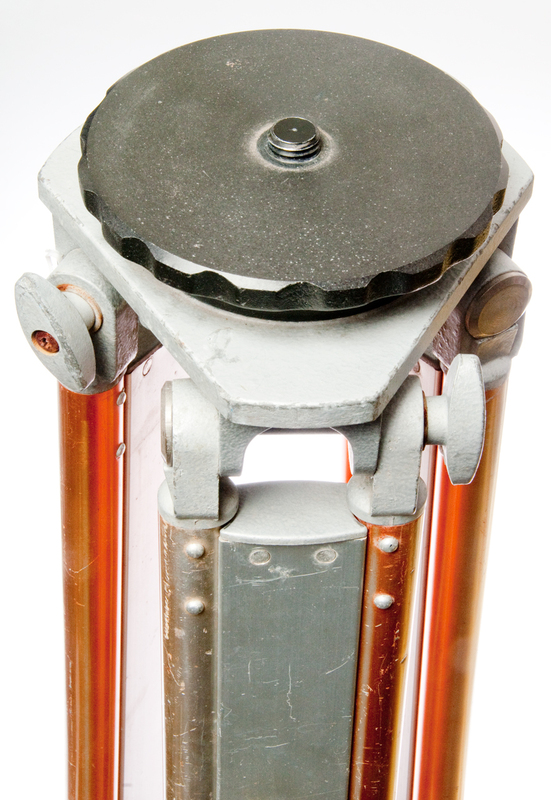 top: 1/4"-20 standard photo tripod thread. 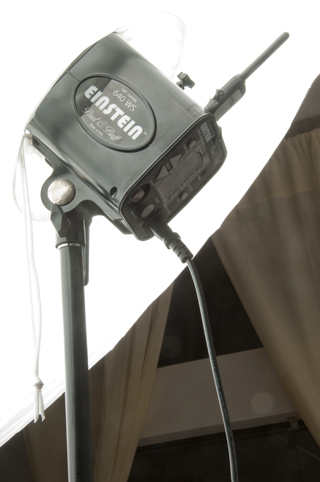 The Einstein 640 mounts on a standard photographic studio light stand. 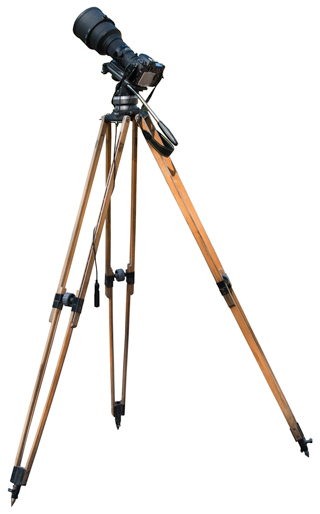 More information about these tripods can be found be clicking on the paragraph title. 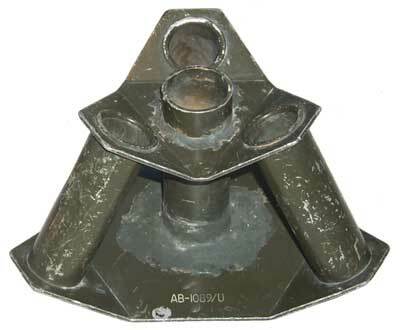 The idea is to use this head with three mast sections to support more mast sections by forming a tripod. Can only be used with some undetermined mast sections. Intended for small movie cameras and low budget applications. Shown with Nikon D300s DSLR camera & 300mm f2.8 lens. This tripod can only be used with this or maybe other Dorne & Margolin antennas. 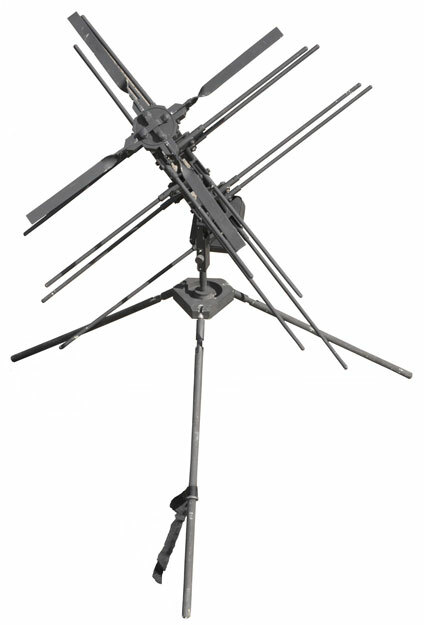 Integrated Television Equipment made TV studio tripods and dollies (SMECC: ITE). I was hoping for a tripod that had more weight carrying capacity than the Arri, but this one has a problem with the legs spreading. By adding a "Y" plate on the ground/floor to stop the legs spreading this tripod appears to be capable of holding the TVS-2 night vision telescope. Pan-Tilt head with a spring on the tilt so that a heavy camera would not tend to fall forward or backward. 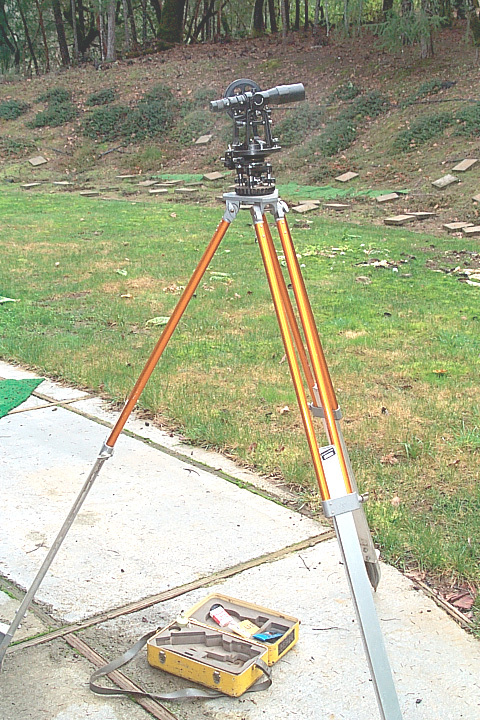 This is a medium quality transit and works with any 3-1/2" - 8 surveying tripod. This tripod is has a special head to allow leveling the plane table. An Alidade (K&E 76 0000) was placed on the table and the combination used to draw scale maps. Custom built tripod to support high power flashlight used to send Morse Code. Used to send Morse Code by reflecting the sun in a tilting mirror. Tripos is specific to this application. 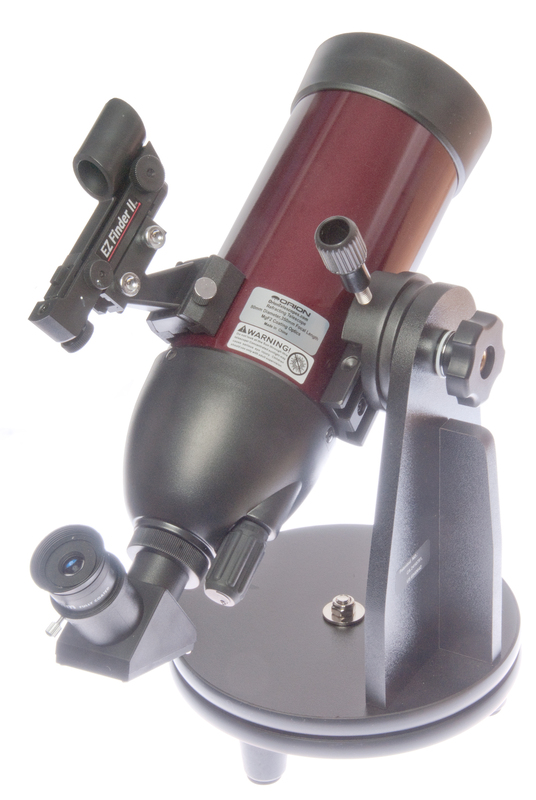 This is a very low cost "Go To" telescope. 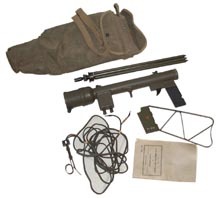 This is a $100 list price range scope that's quite good for the price. Used on a table top. Can see rings of Saturn, moons of Jupiter, our moon and really good for birds. 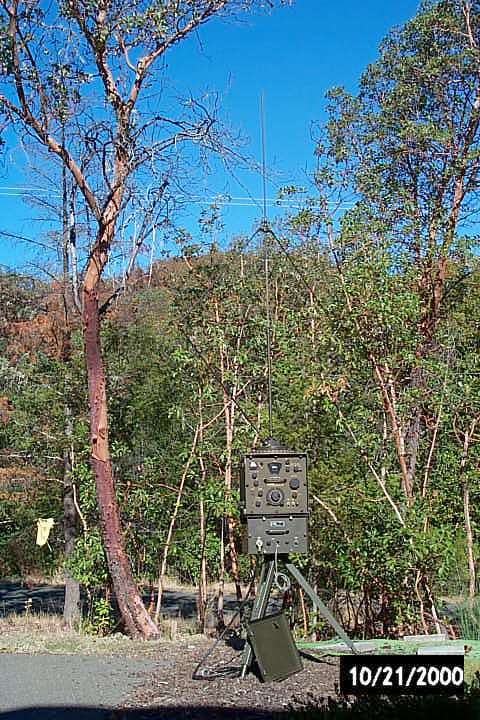 This is a Korean war vintage HF radio direction finder also used in the early part of the Vietnam war. Very heavy equipment so the tripod is much stronger than commercial units. Very light weight and compact camera tripod making it easy to carry. Proprietary quick disconnect pan-tilt head. This tripod can only be used with it's associated level. 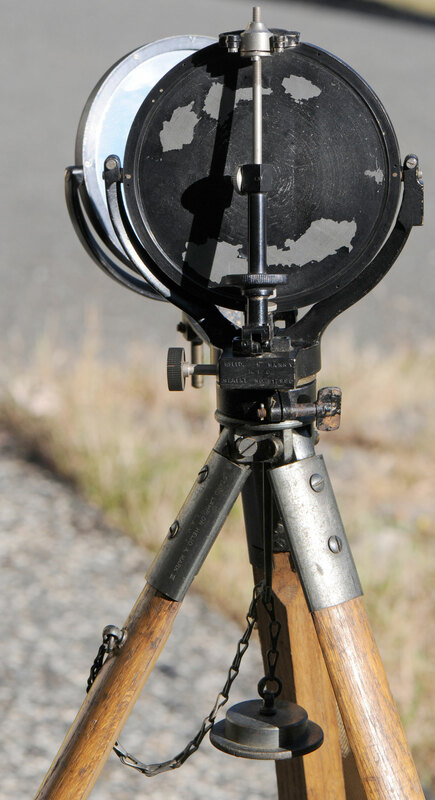 The tripod has the mechanism to plumb the horizontal axis of the level, unlike modern trnasits and theodolites where that function is part of the instrument. All modern tripods do not have a leveling mechanism although some do have a bubble level on the head that's used to adjust the leg length to rough level the head. I had a couple of these, one modified for a view camera and used the other one for a Nikon or Hasselblad camera. Very robust and reliable. All metal construction. But heavier and larger to carry then the modern plastic tripods. This is a stand for holding photo studio lights. This one can be made very small which makes it handy to take on a location shoot. Shown with the legs down, but they can be folded up parallel to the center making it very compact when fully folded. 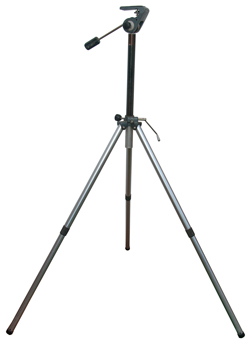 This gyroscope based North Finding surveying instrument is shown on a standard 3-1/2"-8 surveying tripod. Navigation - there's a strong link between knowing position, time and location.